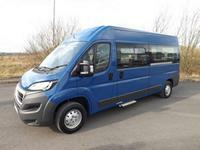 New Peugeot Boxer Lux CanDrive Flexi 17 seat Minibus in Clipper Blue paint finish. Other colours available to include dragoon blue, white, silver and red. Fully maintained school minibus leasing to include full maintenance, servicing, breakdown cover, tyre replacement and puncture repair, annual MOT and road tax costs covered. Price is based on a 5 year lease with a contract mileage allowance of 25,000. To upgrade from the standard base model to a lux model costs £500. Inclusive of integrated touch screen sat nav, c/d player USB input, DAB radio, cruise control and air conditioning. Lease for £395 + VAT per month over 5 years. Still wondering whether to buy or lease a new minibus? Our unique Try Before You Buy and Try Before You Lease deals let your establishment experience a minibus for up to 6 months, with no long-term commitment or obligation.